One of the biggest benefits of using a business travel itinerary template is simply that you’re not starting with a blank page every time you need to create an itinerary for a new trip. This might not seem significant, but the time spent recreating perfectly formatted tables in Word documents or remembering the right equations for your spreadsheet soon adds up over the course of a month. Simply put, starting every itinerary from scratch is a seriously inefficient way for a TMC to operate. Saving a template version of your itinerary that can be repeatedly updated with new traveller information could potentially save hundreds of labour-hours a year. If you’ve ever used a standard itinerary created by GDS software, you’ll immediately understand what we mean when we say they aren’t exactly user-friendly. Often, they’ll be covered in third-party advertising, miss out entire trip elements or use industry-standard formatting that's closer to gobbledygook than English. None of which is particularly useful when a business traveller is rushing across an airport to catch a connecting flight. What travellers really require is a complete itinerary that can be understood at a glance. Not only will this greatly enhance the user experience, it'll elevate your TMC above your competition as a company that understands what's important to business travellers. By using a pre-formatted template and a GDS-decoder plug-in, you can be confident that every business travel itinerary you send to a client provides a stellar user experience. Of course, it's also vital to keep in mind that the way business travellers access their documents is always changing, and, according to GBTA’s Business Traveller Sentiment Index, the vast majority of business travellers now check itinerary details via their smartphone or tablet. You'll therefore need to ensure that itinerary templates created by your TMC can be quickly and easily accessed on any device, without any detriment to user experience or load times. Ultimately, you should be aiming to deliver a single itinerary document that contains all the trip information a traveller needs, from hotel and airline bookings to car hire and ancillary products. And, ideally, this should all be presented in chronological order. Sadly, this isn't always the case, and many GDS-generated itineraries only include the information on trip elements booked through their own systems. If there are "passive" segments detailing externally booked content they tend to be very light on details – resulting in a very disjointed user experience. With businesses travellers now booking trip elements from a range of disparate sources and providers, this issue is only getting worse. And, as "off-policy" booking becomes more common, confusing itineraries aren't the only threat. After all, TMCs can't provide accurate travel risk management if they don't have all the information necessary for a complete view of a trip. Choosing itinerary plug-ins that are able to pick up on details that aren't automatically pulled through by GDSs (for example information entered into the booking notes) will allow you create far more elaborate itineraries. This will greatly improve the user experience and your travellers will have everything they need in a single document. One simple way you can improve GDS-generated itineraries is removing the swathe of third-party adverts that are often plastered across them. Not only does this make them easier to read at a glance, but you can promote your own business instead of potential competitors. Using a custom travel itinerary template provides the opportunity to stamp your TMC’s brand all over the document in a way that doesn't distract travellers and gently reminds them who created the perfect itinerary they're using. A travel itinerary template is also a great space to make your travellers aware of any gaps in their trip, for example, highlighting that they haven't booked an airport parking space or a taxi to take them to the hotel. Filling these empty spaces with simple and unobtrusive adverts that encourage travellers to book any missing trip elements by getting in touch with you could help significantly increase your revenue from ancillary products. This opportunity is growing as the proportion of business trips that have a leisure element continues to grow year-on-year. Your TMC should now be positioning themselves as the perfect bleisure partner for booking an extra night's stay, arranging leisure activities or signposting notable sightseeing opportunities. After all, why would business travellers want the extra effort of dealing with suppliers directly when you’re already engaged in booking travel for them? The benefits highlighted all contribute to creating a much-improved business travel experience for your clients and thereby increasing traveller satisfaction. This is vital for any TMC. After all, if those travelling for business aren’t happy with the service you provide, it’s unlikely your services will be retained for long. And, while it may not seem significant, simply creating and using an extensive business travel itinerary template can have a huge impact on your success. Not just by improving the user experience of your itineraries, but by opening up new merchandising opportunities and making it simpler to remember and incorporate a traveller’s previous preferences. Designing your own itinerary template needn’t be a chore either, even for those with little artistic talent. With the right travel management software you can easily enhance your GDS and gain the ability to not only create fantastic looking itinerary templates, but to automatically populate them from bookings made via your GDS. Simply integrating a travel itinerary template plug-in can consolidate everything from flight details and ground travel information to a complete overview of your accommodation and ancillary products – all utterly ad-free. 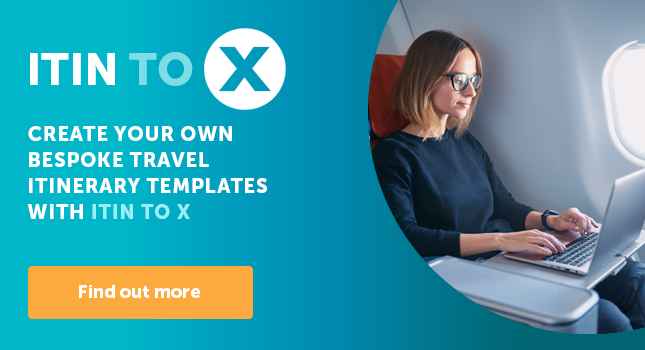 To find out more about creating travel itinerary templates that drastically improve the business travel experience, check out our Itin-to-X GDS plug-in. What Should You Look for in a GDS Add-on? What Does the Future Hold for the GDS?